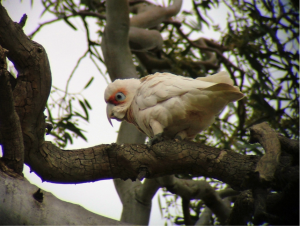 Long-billed Corella. Photo John Spiers. Long-billed Corellas are mainly to be found in the south-east of South Australia and western Victoria. At first their populations suffered severely after European settlement from human persecution, the changes in the environment following the establishment of agriculture, and from the loss of habitat caused by the invasion by rabbits. However, more recent changes in agricultural practices which favoured the spread of onion grass, and control of rabbit numbers by myxomatosis have allowed their numbers to build up again. The major long-term threat is a lack of tree hollows for breeding. Long-billed Corella. Photo: John Spiers. Long-billed Corellas are specialist feeders on underground corms and tubers. Formerly, they fed on a variety of native plants but now they utilise a pasture weed, onion grass (Romulea) and will also take grain from cereal crops and sunflowers. They have also been recorded feeding on insect larvae. They are monogamous, hole-nesters laying clutches of 2-3 eggs in tree hollows from July to October. The chicks are fed by both parents while in the hollow and for a further three weeks after fledging. The species, Cacatua tenuirostris (Kuhl, 1820), is monotypic having no subspecies. Long-billed corellas are mainly white except for having orange-scarlet lores, a scarlet band across the throat, and having yellow tinges to the undertail and under wing. The diagnostic feature is the long pointed, bone-coloured bill which is specialised for digging up underground corms and tubers. They have a small erectile crest. The eyes have a dark brown iris and a large blue eye-ring. The legs and feet are grey. The sexes are alike. Juvenile birds have shorter bills and less orange-scarlet markings around the face. The chicks have a sparse yellow down. Long-billed Corellas are moderately common in the south east. They are also found on the Adelaide plains e.g. in the Adelaide parklands, and in the Mt. Lofty Ranges, but are uncommon. They favour grassy eucalypt woodland and grasslands in areas of low to moderate rainfall (250 -800 mm). Long-billed corellas are sedentary and do not travel far. 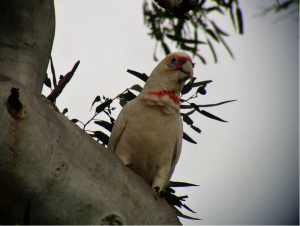 They form small flocks of at most a few hundred birds, rather than the huge flocks of Little Corellas.